I've been learning my photoshop recently and finally, I've done my first art work. haha... It's just simple graphic. 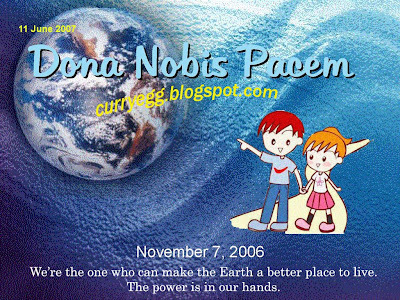 A month ago, I came across with mimi's blogs and I saw her effort in promoting world peace. I'm impressed with her work by getting people all around the globe to work together as a team-a community. She tries to voice out her heart, persuading people to join her campaign. I believe that there are hundreds of blogger who have participated. Well, she has chosen the right place- Blogs! I believe that everyone knows the Power Of Blogs. Blogs are a place for us to shout out our mind when our needs are being neglected either by the government or the media. So, please.... GRANT US PEACE!!! Hey! Are you coming along and join us? It is useless to shout this alone without you. Come on. Lets join the campaign and shout together. Find out how to make your own Peace Globe.